1).Which of the organization has NOT selected to start up new integrated coal gasification, fert plant in Odisha? 2).Online RTI queries were going to be started in which state from New Year? 3).Which of the following movies of Sony Pictures has recently inspired a cyber attack on it? 4).World Bank has sanctioned $130 million credit to ______ for its Grid Solar and Energy Efficiency Project? 5).National Consumer Day was observed on? 6).What is the new deadline to exchange the currency notes which was printed prior to 2005? 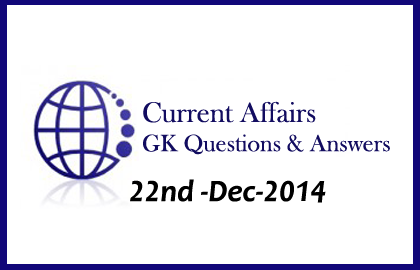 7).Recently, which country has voted to scrap non-aligned status? 8).How many countries have signed Global Arms Treaty recently? 10).Mobile Monitoring System was introduced to track which of the government schemes?